While traveling in Perú, I often found that the servings of vegetables were smaller than I would have liked. There were a few restaurants in the Cusco area that really helped fill my need for fresh veggies (read more about Peruvian restaurants in my ebook). Fortunately, this Onion Sarza popped up as a sort of garnish on many meat dishes that I encountered and I quickly fell in love with it. The way that the freshness of the onions and the mint balanced a cooked meat entrée, like chicharrones, was so satisfying! I knew when I returned home that I wanted to figure out how to recreate it. It’s been a few months since Perú, but I finally got around to recreating this Onion Sarza in my own kitchen. 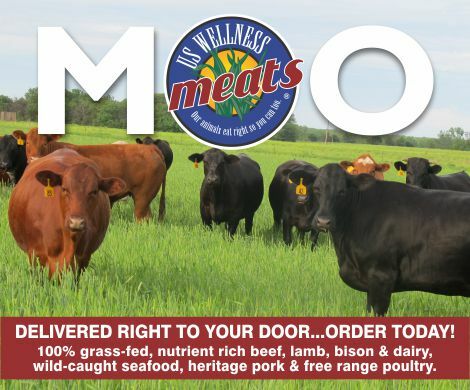 It is such a fantastic addition to any meal and complements cooked meats nicely. 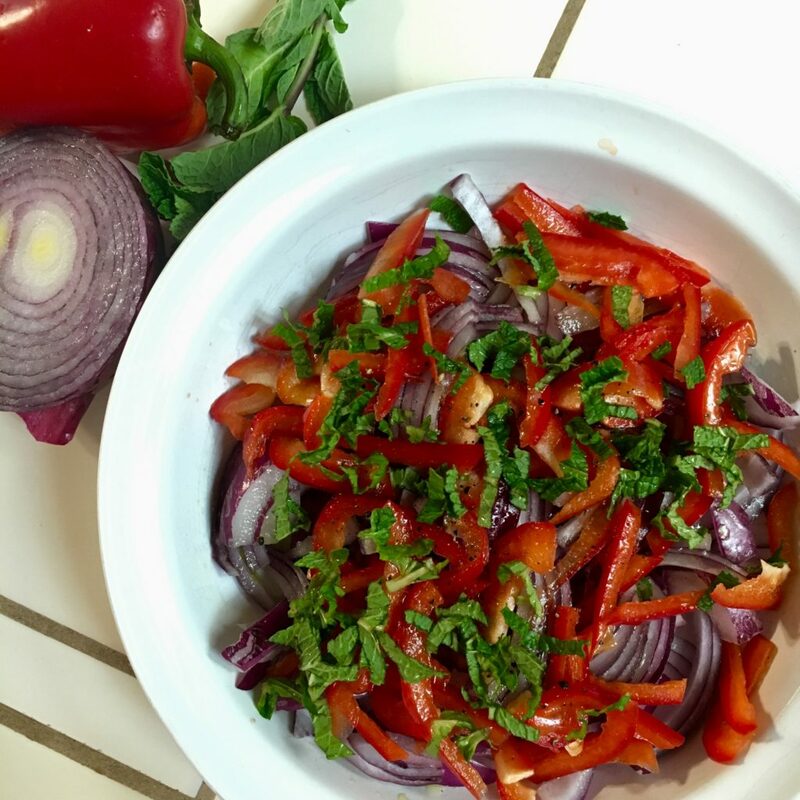 The Onion Sarza is meant to be more of a garnish or small side, rather than a large salad. Unless you really love raw onions! Speaking of raw onions, there is an optional step in the directions of doing an ice bath. If you are sensitive to the pungent flavor of onions, I highly recommend this step. 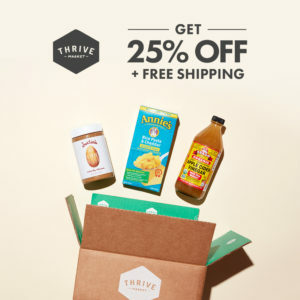 Alternatively, you could make this dish the day before and allow it to marinate in the fridge to help cut the strength of the onion. 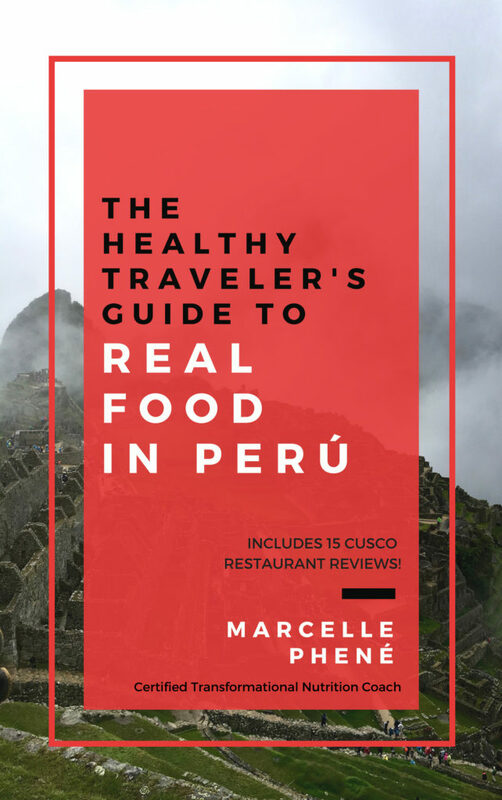 If you are curious about exploring Peruvian cuisine, please check out my ebook: The Healthy Traveler’s Guide to Real Food in Perú. 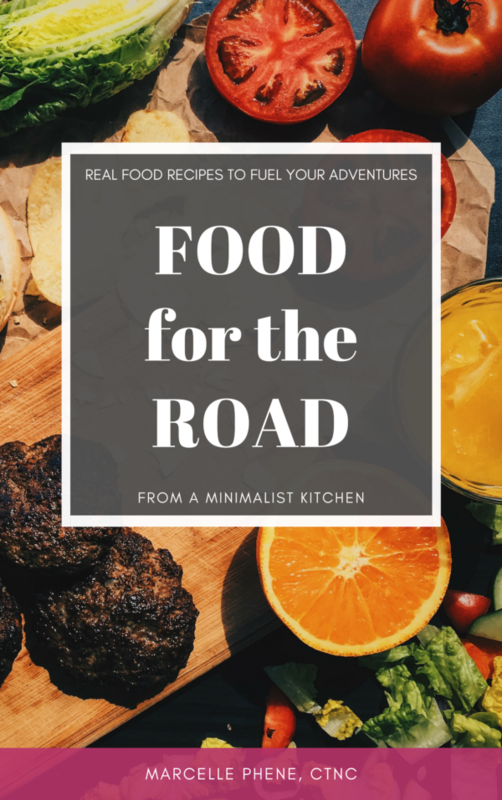 In addition to being an excellent resource for traveling to Perú, this ebook covers a lot about the Peruvian cuisine that you can explore without leaving your own kitchen! Learn about everything from Peruvian superfoods, like maca root, to the local specialties, like “el cuy”! 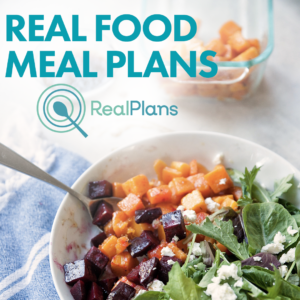 If you enjoy this recipe, please check out some of my other real food recipes! Including my Sweet or Savory Plantains recipe, another Taste of Perú! Chop the red onion into the thinnest strips you can safely manage, about 1 to 2 inches long. Optional step: to help reduce the power of the onion, submerge the sliced onion in a bowl of ice water for 5-15 minutes. 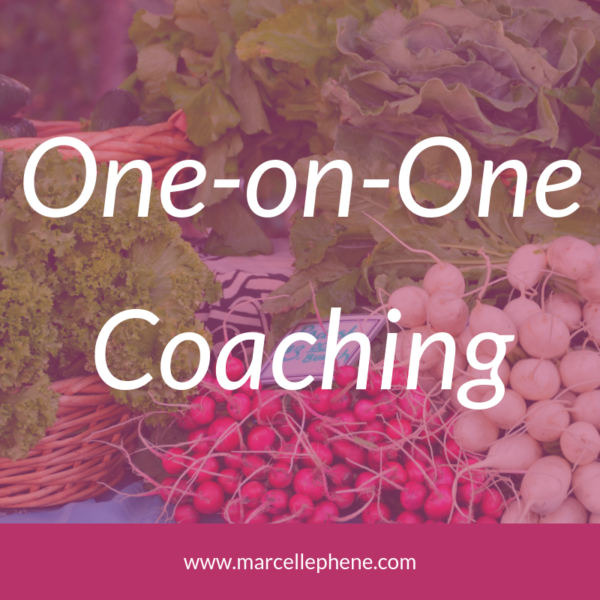 Add the sliced onion to a small salad or serving bowl. If you followed the optional step above, make sure to strain the water from the onions. Same as with the onion, finely slice the red bell pepper into the thinnest strips you can safely manage, about 1 to 2 inches long. Add to the onions in the bowl. 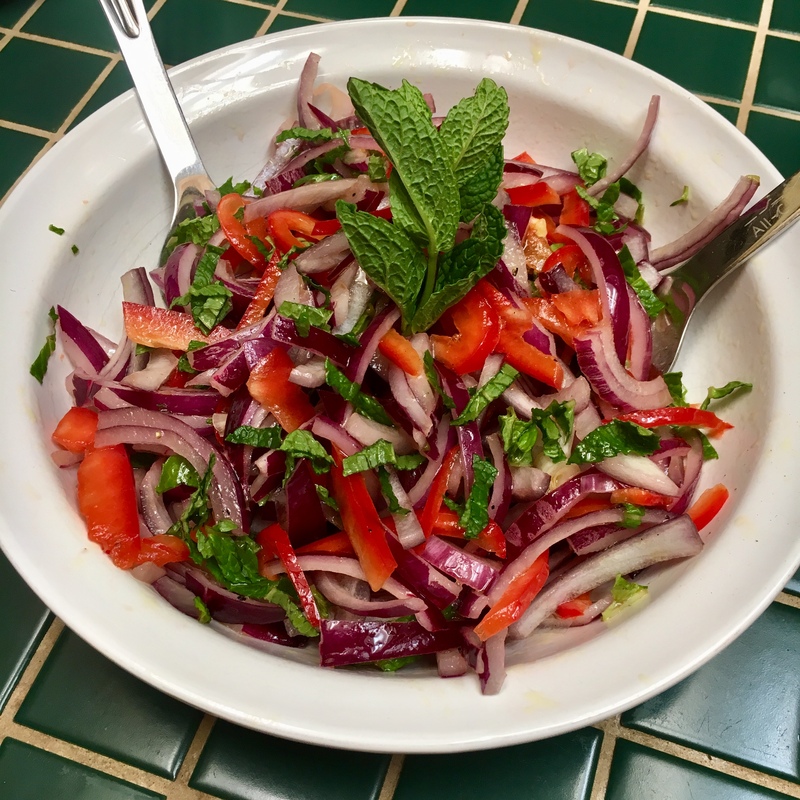 Finely chop the mint leaves into thin strips and sprinkle on top of the onions and bell peppers. Spinkle with salt and pepper to taste or leave out entirely. Drizzle the EVOO and the lemon juice on top and toss well to mix. Serve the Onion Sarza cold as a garnish or small side dish. 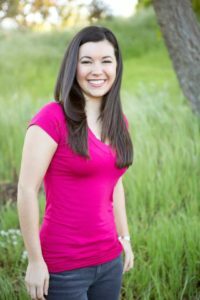 Please let me know if you have any questions or comments, I love hearing from you! 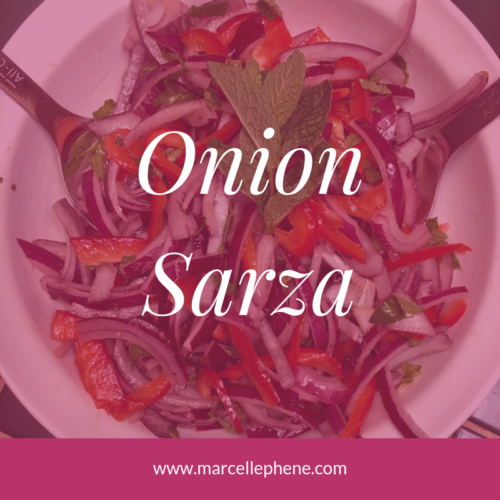 Spread the Love and share this Onion Sarza recipe with someone!